Bei Indiegogo läuft derzeit eine Kampagne für zwei kranke Mädchen aus England. Annamaria is a young pretty 12 year old girl from London. She was diagnosed with a large cancerous tumour in her chest, but is a great joy and has a strong will to fight on. She is an avid Harry Potter fan, so Francesco decided to sculpt her during a spell cast dressed like a Hogwarts student. Poppy is an adorable 4 year old girl from Beaconsfield. She is little and cute, but also combative! Poppy was diagnosed with lung and abdominal cancer. At every surgery and chemio session, Poppy has her little elephant to help her against the enemy. Both models have just been printed and are ready for moulding. 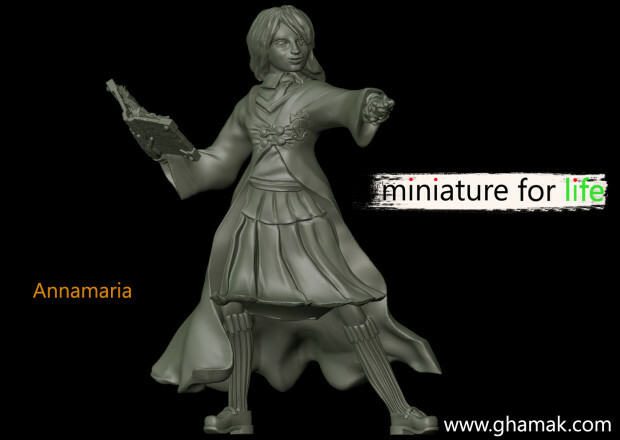 Models are resin made and 54 mm scale, so Annamaria is tall about 40 mm and poppy about 25 mm. Annamaria and Poppy have fought side-by-side together against cancer these past months, so in true nature of their combined efforts, the models of the two girls will be sold as a pair. All the money raised by the campaign will go to the Poppy’s Angels support funds. The only cost we need to cover is about resin cast. The models have been sculpted by Francesco Pizzo (from Ghamak) and digitally printed by Emiliano Mancini (from Maki Games), David Coates will produce these in resin, and Paul Bullock (Poppy’s father) will ship them to your home. What will doing with these money? By purchasing these models, you will be helping Annamaria and Poppy. 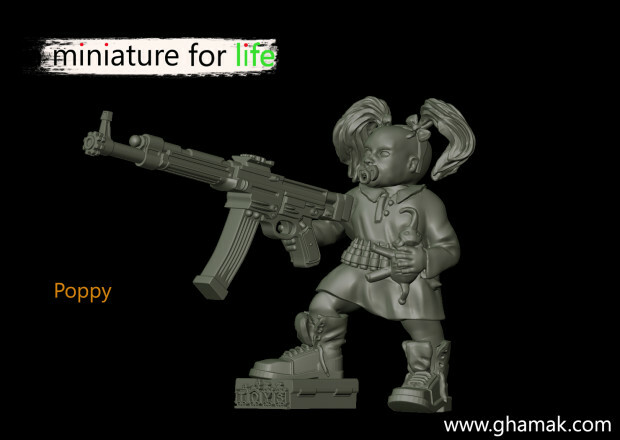 With the exception of recovering the cost for the resin cast process (about 500 euro), all the money collected will go to helping the families of the little girls. Die Kampagne muss ihr Ziel noch erreichen, es bleiben 3 Tage. Das Modellset kostet 22,00 Dollar. Habs unterstützt, danke für den Hinweis. So, und jetzt hoffentlich noch ein paar von euch!